Today's Art Talk Monday is written by Hannah Bustamante, of the Louisiana Tech Enterprise Center. The Come & See exhibition includes several NCLAC member artists. Be sure to stop by and see the show! 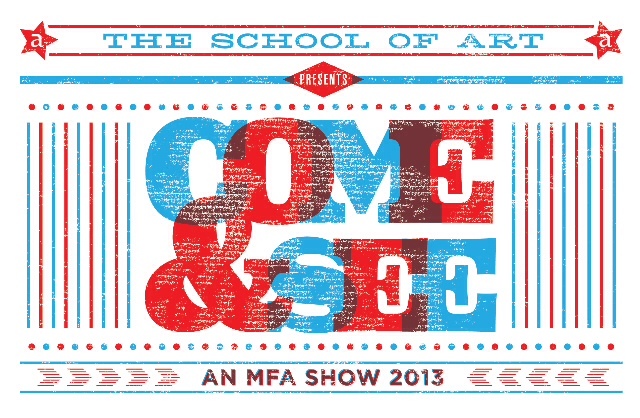 Louisiana Tech’s Enterprise Center Gallery presents Come & See: An MFA Show. The exhibition will run from January 11-February 15, with the opening reception was Friday, Januar 11, from 6-8pm. Both the exhibit is free and open to the public. Candidates for Master of Fine Arts degrees in the Louisiana Tech School of Art pursue courses of study in Communication Design, Photography and Studio Art. These students are highly motivated and working in a wide range of styles and approaches in this interdisciplinary program. The annual MFA exhibition is a milestone in their careers. Please join first- and second-year MFA students Catherine Crow, MC Davis, Jake Dugard, Christian Dunn, Mary Dunn, Jenna Fincher, Allan Garcie, Peter Hay, Jaime Johnson, Matthew Knopps, Meredith McGregor, Casey Parkinson, Brittany Spencer, Rachel Spencer, and Yijun Yao for Come & See, a show encompassing various disciplines including painting, photography, printmaking, multimedia and communication design. The Louisiana Tech Enterprise Center houses the Louisiana Tech Technology Incubator and the Technology Business Development Center. As the primary business support and development outreach arm of Louisiana Tech University, Louisiana Tech Enterprise Center is designed to facilitate and promote the growth of new and existing ventures of the innovation enterprise in the I-20 corridor of north Louisiana. For more information about our programs and exhibitions, please email hannahb@latech.edu, call us at (318) 257-5281 or visit latechenterprisecenter.com. The Enterprise Center at Louisiana Tech is located at 509 West Alabama Ave., Ruston, LA 71270. We are open to the public Monday–Friday, 8 a.m.–5 p.m.
NCLAC note: Mark your calendars for Saturday, February 2, when the Ruston Civic Symphony Society and the North Central Louisiana Arts Council will hold the annual Mardi Gras Ball and Silent Auction! Bill and Lynne Gnemi are this year’s King and Queen of the Krewe of Allegro. Silent Auction items are rolling in, including goods and services from area merchants, as well as pieces from area artists. The Chartreuse Pear, Bodie’s Furniture, Devine Wines and Spirits, as well as artwork from Julie Crews, Marie Bustamante, Frank Hamrick and Dorene Kordal—these are just a few of the many varied items that will be available for auction. Tickets to the Ball are available at the Dixie Center for the Arts. Call 255-1450 or come by 212 North Vienna to get your tickets.